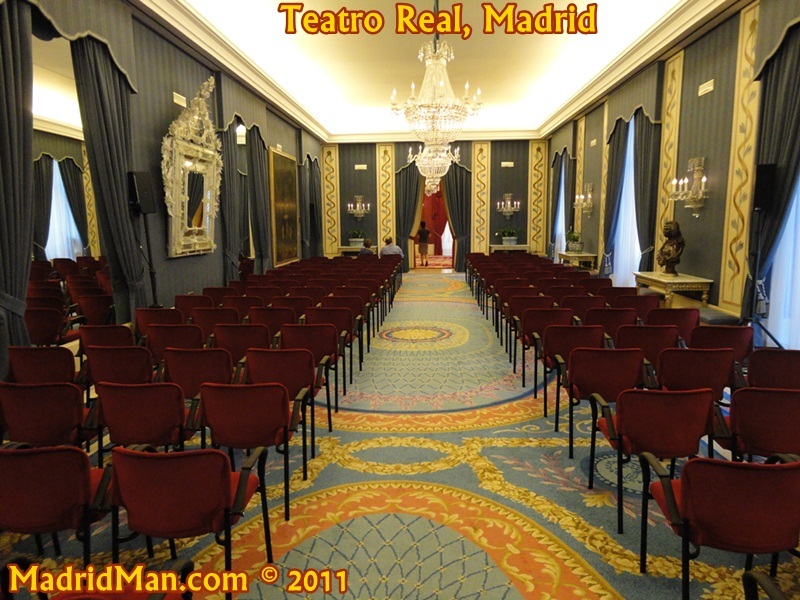 Front row, near center, second level is from where I witnessed probably the world’s best known ballet, “Swan Lake“, at Madrid’s Teatro Real last night. In Spanish, it’s called “El Lago de los Cisnes” and was performed by the Russian ballet group, Novosibirsk. I’d never seen this performance before in my life, only segments on TV, and it did not disappoint. Captivating, to say the least. There were times that I was near tears. It sounds silly, I know, but it truly was emotional, so perfectly tippy-toe danced, and the accompanying orchestra played well, too, in its pit – into which we had a perfect view. It would be foolish of me to profess expertise in ballet or orchestra music, but seeing “Swan Lake” for myself was an experience I won’t soon forget. Surely, 26 white-tutu-wearing ballerinas had never danced so well in Madrid before. 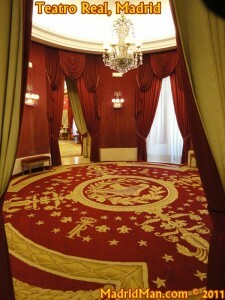 The 3 different stage sets were enormous and appeared to be works-of-art in and of themselves. Acts 1 & 2 lasted 75 minutes, then a 25 minute break, and acts 3 & 4 lasted 60 minutes. The Ballet started promptly at 8pm and finished at 10:40pm. 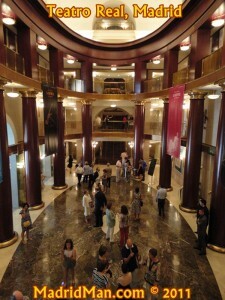 Since we arrived 35 minutes early, we took a lazy stroll through the “salas” (halls & rooms) of Madrid’s Opera House on its southern side, starting at the 4-story-high main entrance on the western Plaza de Oriente side and walking to the Restaurante Teatro Real on the eastern, Plaza de Isabel II side. You’d think you were in the Royal Palace itself! Photos are NECESSARY in the halls and restaurant, but not (really) permitted in the main entrance or in the theater itself. In the latter, the attendants will quickly, although nicely, wag a finger if they see you holding up a camera. As I said, the mid-point break lasted 25 minutes. 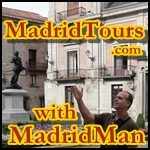 People could go out onto the large, wide terrace of the Teatro Real’s west side, overlooking the Plaza de Oriente and the Palacio Real/Royal Palace, or go to the Restaurante Teatro Real. 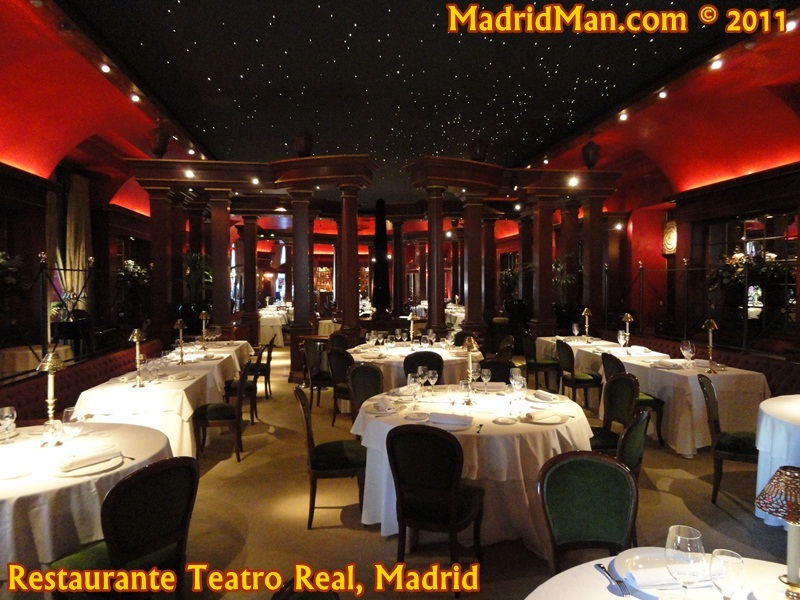 Since, ahem, I’d been out on the terrace on previous visits to Madrid’s Royal Theater, this time we went to the restaurant, arriving quickly after the end of the first half of the night’s stunning performance. So WHAT do people do during the break at the opera or ballet?? Answer: They typically have a glass of champagne or, in Spain, its “Cava“, Spanish sparkling white wine, and maybe something to eat. 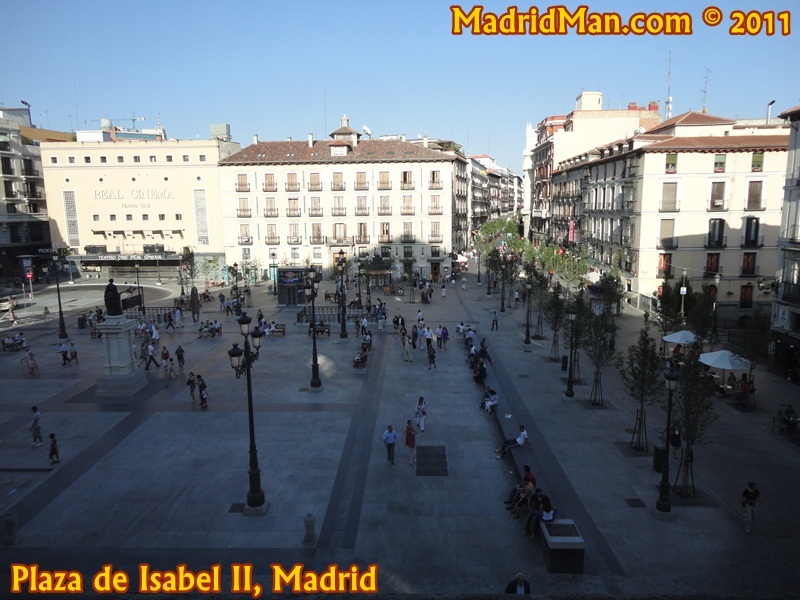 We did both; two flutes of cava and two large “canapés“, one of tortilla de patata and another of crab (read: surimi), both served on toast, and all enjoyed with a window-side table view of the freshly-renovated & pedestrian Plaza de Isabel II at near-sunset. Could this evening get any more romantic?! PUH-LEASE! Swan Lake’s second half was as entertaining as the first and we were sad to see it end. 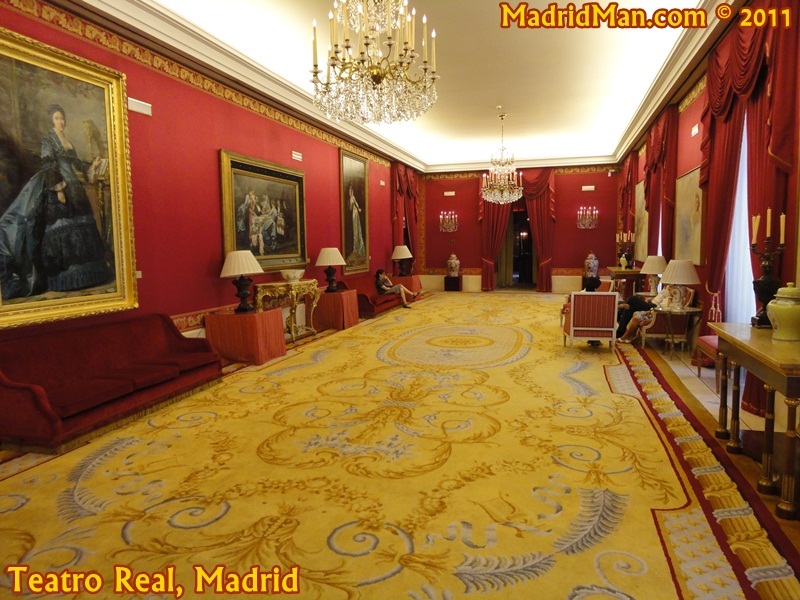 But it did, of course, and we left Madrid’s Teatro Real to the still-warm and buzzing streets surrounding “Opera” and the Royal Palace of Madrid, Spain – my home. Sometimes I truly feel I’m living a charmed life. 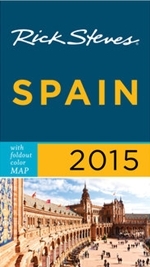 This entry was posted in Entertainment, Photos and tagged Ballet, ballet program, Cava, Lago de los Cisnes, Madrid, Novosibirsk, Opera, Opera house, Palacio Real, Plaza Isabel II, Plaza Oriente, program, Restaurante Teatro Real, romantic, Royal Palace, Royal Theater, Russian Ballet, Salas, Swan Lake, Teatro Real. Bookmark the permalink. Novosibirsk is the capital of Siberia . My brother went there a few times and said it was awful !! But , obviously , this is a phoenix rising from the ashes that out of the greyness of Siberia they can produce such a beautiful ballet . My favourite ballet company is ‘Matthew Bourne´s Swan lake ‘ where the swans are danced by men , including the wonderful Adam Cooper from the Royal Ballet School . If you’ve seen the Billy Elliot film you’ll have seen Adam Cooper right at the end of the film playing the adult Billy Elliot on stage . The idea of using men was to underline the evil and dark side of the swans . Really spectacular . 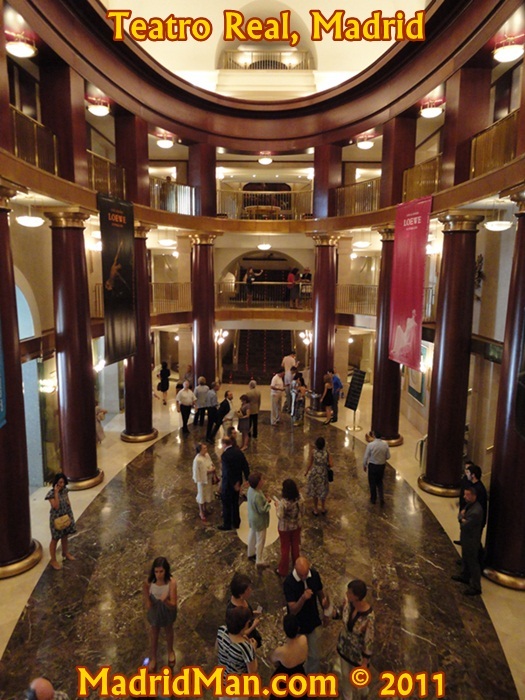 I’ve only been to the Teatro Real a couple of times .. both with MM I believe , and I fell in love with the building . Totally spectacular inside ! 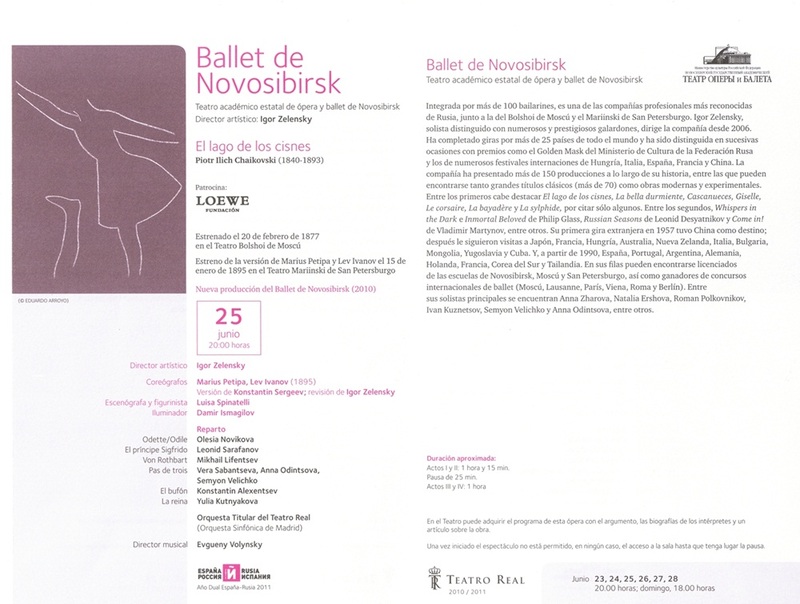 I noted that the fantastically famous fashion company , Loewe , (Spanish ) ,is supporting this ballet .